Note Songs: It's All Lisa's Fault! You are too funny with all your cow. I love them and what wonderful colors. be still my heart. How adorable!!! Oh, girl, I may have to high-tail it to Kohl's too!! I love them! Oh, how cute! How cute! I live them!!! I might have to start collecting. I was somewhere the other day when I saw a white one. I almost picked it up and sent it t.onyou, but I knew you already had one. I "HERD" you loved cows! Now I know it's true! LOL, Thanks for the morning giggle! Too funny! Seems I got you mooovin' over to Kohl's to take a look and you could not resist. Of course not, they are perfect in your kitchen. Glad I could help! Have a delightful day with all of your colorful cows....I love it! I have never seen so many different color cow creamers. You are after my heart. I had brown one years ago and it got broken. Love the green one. Uh-oh, Shelia, now I've been tempted, too. And this time, it's all your fault! :-D Wow, I'm heading over to Kohl's today; I had no idea they had all these cute things in stock. I like cow creamers, too (I only have two at the moment). I love that you bought one in every color. They're perfect for your pretty kitchen, Shelia. I'm really glad you shared this with us. Now you'll have to come up with names for your new girls. The are so cute Shelia! Leave it to you to give into temptation and get one of each color. You are now tempting me to start collecting cow creamers. But where would I put them? My house is full! Shelia the rainbow creamers are so cute! Now i'm dreaming a of red cow on my counter!! So cute....I gotta stay out of that store....cuz, I do NOT have room for them...and I would want to bring them home! Oh Shelia, your a bad girl, but I do love the colored cow creamers, especially the red one. They look so good in the kitchen. My fav is roosters/chicken and then piggies and cows. I saw Lisa's post, too! Cow creamers everywhere!!! Love them all. Thank you, Martha, and you have a great weekend too. Oh Shelia these sweeties are so cute. Love the colors!! 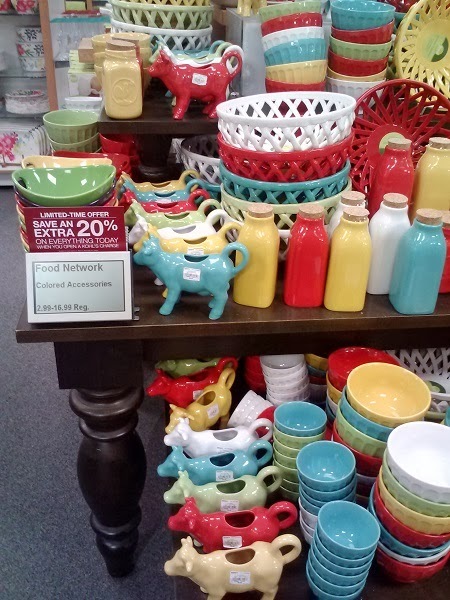 I am getting inspired to add some cow creamers to my kitchen. They look darling on your counter. Did you name these darlings? Have a lovely St. Patrick's Day weekend. Shelia, loving your cow creamers and love how you introduce them to us! Just adorable! I'm always in for a great chuckle and smile when I drop in! I love your happy posts! I love your new girls. Your make me laugh. My grandson heard me chuckling and wanted to see what I was reading he smiled too. I am typing on my iPad in the car. Don't worry, I am not driving. Hi Sheila....I should have known it was your blog when I saw you say someone made you do something....always great to blame someone else when you go crazy and buy something is every possible color the thing comes in....I would have done the exact same thing.......buy them all then put the blame on someone else....I love it!!! They are so cute and too hard to resist. Love the colors! These are adorable. And Kohl's, I see! Could be trouble as they'd look great with my Fiesta ware! Oh my goodness, the "cuteness" is almost more than I can stand! I don't like Kohl's, but I may just have to go see what this is all about! Your colorful herd is growing, and you can put most of the blame on your friend. Of course some of the blame is on you, you did drive over to Kohl's, but how in the world could you resist these cuties? Your creamers are lovely, and look fabulous in your kitchen. You go, girl!! We may have to stage an "intervention" to help you control your cow creamer addiction !!!!! Oh Shelia I gave you a shout out on my blog and said you had just wrapped up a Cow A Day series and here you got more!! LOL... Those are very cute- love the variety of color! Oh Shelia, be careful...you almost caused me to choke on my cough drop with your darling humor. Those "girls" are pretty in all their color! Remember when you're about to be so funny...we need notice about the cough drop in our mouth! I am serious! Cute post anyway!